Autosomal dominant polycystic kidney disease (ADPKD) is an inherited nephropathy that often progresses to end-stage renal disease. Mutations in either the gene encoding polycystin-1 (PC1, PKD1) or polycystin-2 (PC2, PKD2) underlie this disease, with PKD1 mutations associated with more severe disease and earlier onset. The extent of PC1 maturation is indicative of disease severity in individuals with PKD1 mutations. PC1 forms a complex with PC2; however, it is not clear if this interaction influences PC1 function. Vladimir Gainullin and colleagues at the Mayo Clinic determined that PC1 interacts with PC2 within the ER and that this interaction is essential for PC1 maturation and surface localization. In mice, complete loss of PC2 prevented PC1 maturation, while mice heterozygous for Pkd2 exhibited a nonequimolar reduction in mature PC1 levels. Interbreeding of Pkd1 and Pkd2 mouse models revealed that reduction of both PC1 and PC2 in the kidney results in severe, rapidly progressive disease. Together, these results indicate that PC2 is required for PC1 function and that mature PC1 levels dictate disease severity of PKD2 as well as PKD1. 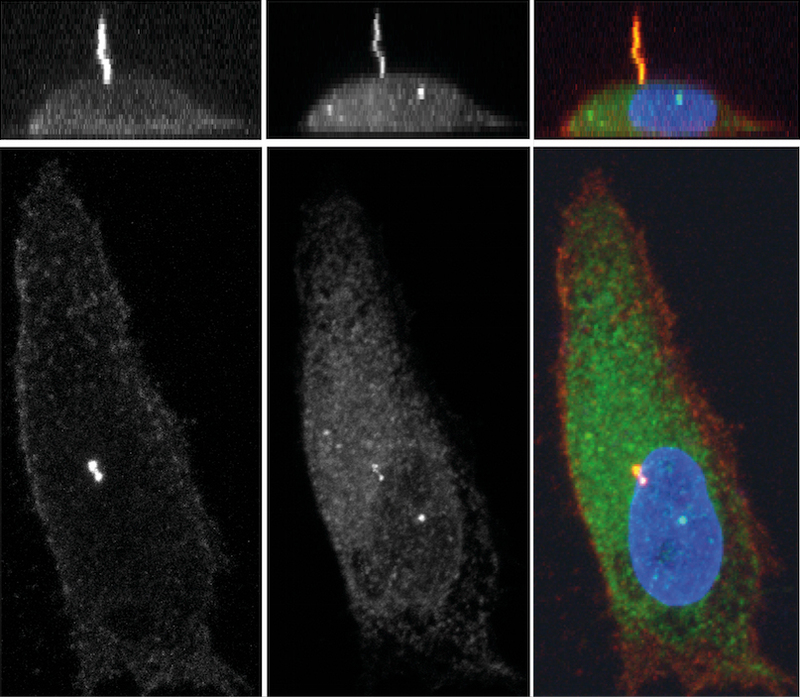 The accompanying image shows optical sectioning (z-stack (top), XZ plane (bottom)) of a confocal image of ciliated renal cortical tubule epithelial cells cotransfected with mCherry-PC1 (left) and GFP-PC2 (middle). The merged image (right) shows that surface PC1(red) and PC2 (green) colocalize in primary cilia, while PC1 is also present on the plasma membrane. Nuclei stained blue with DAPI.